I'd like to thank all of the amazing sponsors that provided samples of their products. We have double the swag since both of us were registered attendees. This is only half of our haul! The Mars Petcare bag was a special delivery to our rooms. It was filled with goodies and is a computer bag. 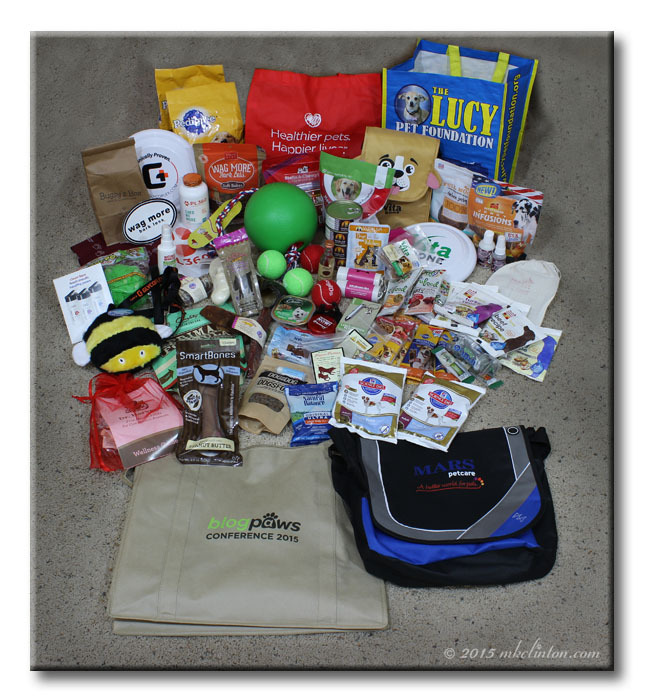 Our BlogPaws swag bags were chocked full of so many terrific items. Bentley whined the entire time that we were taking this photo! Everything will be sampled or shared. We are truly grateful for the generosity shown by each of these sponsors. We are joining BlogPaws for the BlogPaws Conference and Wordless Wednesday blog hops. Enjoy visiting these fun blog post below. That is so cool! You guys made out like bandits! :D I love going to events and getting samples it's fun to try new stuff! Same here! We got double the stuff and were so happy to donate what we knew we wouldnt use! Such great and generous sponsors! Mostly my belly is happy about the edible swag! Some wonderful things we got! We are still going through all our wonderful swag. We have donated some of it and will probably donate some more. wow wee look at all the good, enjoy! Have a wonderful day. Holy moly that is one heck of a swag bag full of stuff!!!! Woof-hoo for swag!!! So much great stuff in there! Wow you got a lot too! We had over 80lbs of swag that we brought home... so glad I bought an extra suitcase! :) It was great seeing you again at BP! Wow! That's a lot of great stuff! Wow, you sure bagged up on supplies there! Necessary supplies, of course!!! Bentley is going to be able to eat his weight in treats! That's a lot of great stuff. I bet your dogs will have fun sampling everything. I'm glad you had fun at BlogPaws. Next year...maybe. Holy woofs, that's a lotta swag! NICE! I agree! We got such amazing swag this year. Here's hoping next year will be just as awesome! Nothing better than swag bags!!! MOL! We've been mistreated too - our mom's posting tomorrow! That's WAY too long to wait! Everyone said how great the swag would be, but still, I was amazed! I am still sorting through everything! It is so great how generous these companies are. That is a lot of stuff! Looks like you had a great time at Blog Paws. That's a ton of stuff! So much swag we missed out! Nice loot you got there! Seriously looks like everyone walked away a winner! That's a massive haul of swag, WooHoo!!!!! We are having such a good time sampling all the cool products in our swag bags. I love the bags themselves too! We shared a few items with Isis' boyfriend, Cooper next door but I noticed she didn't seem all that happy to share with him, LOL!